Review by AllTheBestFights.com: 2016-08-19, fight not particularly good between Jarrell Miller and Fred Kassi: it gets two stars. The undefeated Jarrell Miller entered this fight with a professional boxing record of 17-0-1 (15 KOs=88%) and he is ranked as the No.29 heavyweight in the world. He has already fought twice in 2016 defeating Donovan Dennis (=Miller vs Dennis) and Nick Guivas. His opponent, Fred Kassi, has an official record of 18-5-1 (10 knockouts) and he entered as the No.94 in the same weight class but he comes off two losses, against Dominic Breazeale (=Breazeale vs Kassi) and Hughie Fury (=Fury vs Kassi). Before these two bouts he had drawn with Chris Arreola (=Arreola vs Kassi). 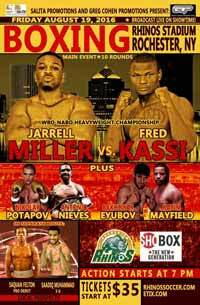 ‘Big Baby’ Miller vs Kassi is valid for the WBO NABO heavyweight title. Watch the video and rate this fight!